At the end of each month I will announce the totally optional theme for the following month. 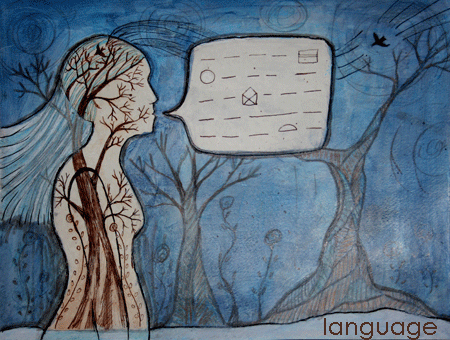 For the month of April 2012, the theme will be Language. As always, this month's theme for the Creative Every Day Challenge is totally optional. Use it if it inspires you, continue being creative every day in your own way if it doesn't, or do something in between. You can sign up for the 2012 Creative Every Day Challenge anytime. More info can be found here and the sign-up page is here. *Include writing in your native tongue or a foreign language in your work. *Let the origins of a word inspire you. *Write a poem and speak it out loud. *Use pages of a book in a mixed media piece. *Express an idea in the language you imagine an object (chair, tree, cloud) would speak if it could. *Try expressing yourself through the language of movement. *Let what you wear tell a story today. This fits perfectly with the e-course I’ll be taking starting Monday which is Poem It Out by Liz Lamoreux. I’m sure to have lots to share! I’ve wanted to jump in since January! As a writer, I love this theme, plus it correlates with my new passion — make art journals out of old books. Can’t wait! I would just like to saynthst I have just recently found your blog and I think it is wonderful. It is exactly what I have been looking for. I need the inspiration that you give. You have such great ideas posted. Also, I like how you have everyone who is participating all linked together so we can have a central location to get to everyone else’s blog. It is wonderful! Do you mind if i snag one of the “Creative Every Day” tags on the side and post on my blog with a link back to yours??????? I am just so excited that I found your blog! I look forward to creating with everyone. Oh yes, I like April’s ‘Language’ inspiration! And I love this painting. It holds so many possible stories and meanings. To finish off the mixed-media theme I’ve posted photos on my blog of my travelling journal. I fear it isn’t up to the standard of my swap buddies but I had fun creating it and it helped me get out of a creative slump. ohmigawsh! You seem to know exactly where my heart (and my art!) lives! I am focusing on Women Writers in April… so wow, this is a natural! THANK YOU always, for all you do! Hi Leah, This is a great theme! It’s fun to include language into our design pouch. Stories and poetry can flow along with beautiful art very well. I need to stretch my creativity more and put some stories into my work. Thank you for presenting this charming prompt. I have loved all of your monthly themes this year! Thanks for inspiring me each month!